Soups and chillis are some of my favourite recipes to make because they are “one pot” meals, and I love making anything that allows me to prep, chop and cook ahead of time. Anyone with kids knows that evenings are insane, and who has time to make recipes that require cooking before serving? Maybe a side dish here and there, but recipes that you can prep or make ahead are ideal. My meal plan for this week includes my Butternut Squash and Sausage Chilli and Curried Red Lentil Soup – both easily made ahead of time. 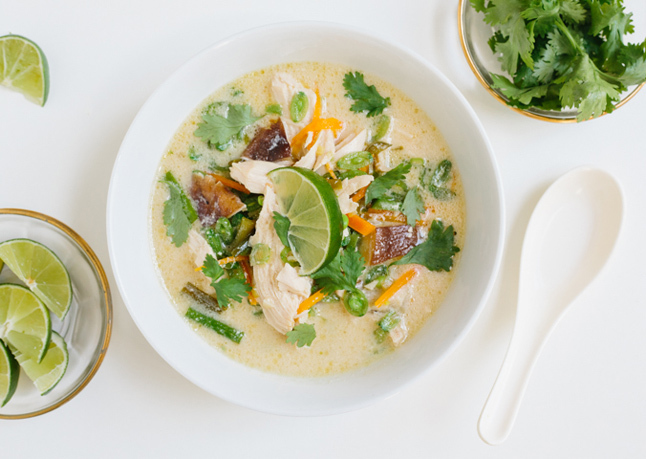 I’ve had a craving for Thai flavours lately, which when done properly is the perfect balance of sweet, sour and spicy so I combined a couple of my favourite recipes to make one delicious Creamy Coconut Chicken Soup. It’s creamy from the coconut milk, and filled with chicken and crunchy fresh vegetables like bell pepper and snap peas. Not only did my husband say it’s the best soup I’ve ever made, but Jack, my two and a half year old ate the whole thing – that’s a win in my book – another easy, healthy, delicious recipe I can add to my “Jack will eat this” list. On a side note, Jack started Montessori School in September where they make and serve him lunch, and I’ve definitely noticed a difference in his willingness to try and like new foods. It just goes to show you that if your toddler is hungry, they will most likely eat what you’ve put in front of them. Jack’s school serves a lot of quinoa, lentils and beans, whole wheat pasta as well as eggs. Good job Westboro Montessori! With the cold, snowy weather upon us it’s officially soup season and this one is super warming and delicious (and easy!). Enjoy! Dice raw chicken thighs into bite-sized pieces and set aside. In a large soup pot, melt butter on medium high. Toss in the onions, celery, ginger and garlic and saute for a couple minutes or until fragrant. Pour in chicken stock, coconut milk and fish sauce and whisk in curry paste. Add the chicken and bring up to a boil. Once boiling, turn heat down to medium low and simmer for 10 minutes. Add in the frozen peas, bell pepper and snap peas and saute for 5 more minutes. Remove from heat and pour in the lime juice and toss in the cilantro. Serve into bowls immediately, or let cool and reheat later. Enjoy!